I was hearing Camerata Tinta Barocca for the first time, and without being corny, I really felt I was transported back into the early 1700s. There is something very surreal about the subdued sound of period instruments, in browns, greens, and turquoises, being produced by modern people, that I could not escape the feeling that a 300 year-old event was literally occurring on the stage in front of me. It is a much darker sound than that of today’s instruments, more intimate, friendly, and approachable. A common criticism of period instruments is that they do not stay in tune, so the harmonies are not as accurate. But I have to say, with an extremely critical ear, and without any intention of sympathy, I found that the flexibility of tuning actually added to the fullness of the sound, as opposed to the more clinical tuning to which I have become accustomed to hearing. 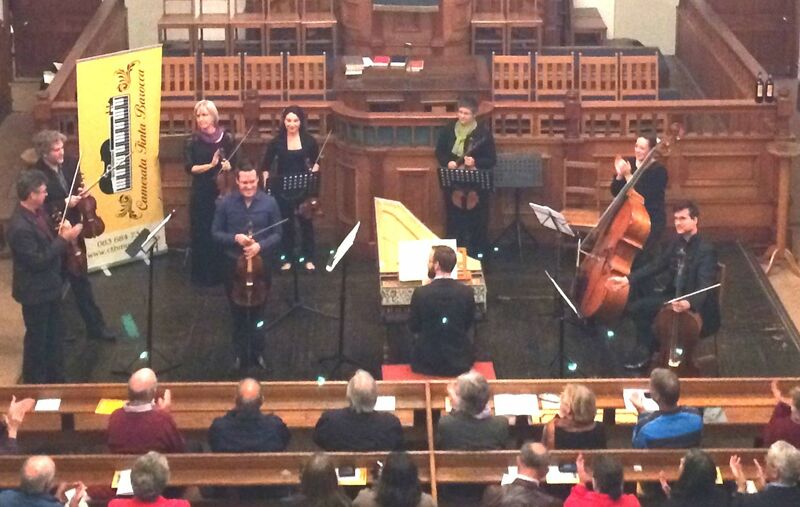 I was fascinated to hear the technology that was cutting edge for Telemann and Bach. The “A” was a mellow 414Hz, a semitone lower than concert pitch (440Hz). One of the more popular tuning systems of the time, it adds to the relative softness of the tone. The lower pitch requires strings to be less highly strung, and woodwinds require less breath. Soloist Emile de Roubaix coaxed incredible dexterity from an instrument that must be somewhat frustrating to play, not unlike trying to speak through a mouthful of marbles. 18th Century violas (and violins) did not have a chin rest. This later addition has nothing to do with resting the chin, it is for holding the instrument still while you play it! – So there is a sliding that one has to control. The bow has less hair on it, the gut strings shrink and stretch very easily (going out of tune) and they are softer, so the price of this wonderful warm sound is much harder work, and more attention to accuracy. De Roubaix performed with impressively clear trills and runs, and exciting dynamics. 1. The openings bars, with recorder players Barbara Warner Smith and Darryn Prinsloo, were like the smile of an old friend. Hearing this work on period instruments, I was reminded that only a few generations separates Baroque from Renaissance music, but the instruments were very much the same, and I found myself quite surprised by the Shakespearian enchantment of the rich mellow sound from the wooden alto recorders. It completely transformed my aversion to this instrument, an unfortunate memory of a room full of eight-year-olds tweeting three notes loudly and tunelessly. There is something quite cerebrally calming and therapeutic about the combination of Bach’s surprisingly logical progressions, and the organic living sound of Carmina Tinta Barocca. Violin soloist Quentin Crida’s dexterous annunciation of semiquaver triplets was notable. 2. Although he is now one of my favourite composers, Bach eluded me for many years. Listening to these 9 instrumentalists performing one of the composer’s most recorded works, it made complete sense to me that Bach never imagined his music to be performed by large orchestras. I shudder to think that hundreds of thousands of people have been tricked into thinking, as I once thought, that the Brandenburg Concertos are ponderous, melodramatic, and somewhat tedious, because the first conductors who were recorded on vinyl, were the descendants of the Wagnerian school. If unshaken, western classical music will SEPARATE into extremes, on one end: Bach, on the opposite extreme: Wagner. LP records circulated rapidly, and within only a few years, the fashion of playing Bach in the late romantic style – which just happened to coincide with the invention of recording technology – that fashion was set in wax, for later generations to regard as archetypes, and even legends. These 9 musicians produced an exciting, clean, vibrant, young, living work. One bass (Roxane Steffen) and one cello (Cheryl de Havilland) brought all the depth and darkness of a Bruckner symphony. After hearing the Brandenburgs in this way, I never want to here the full orchestra again! 3. Crida, Warner Smith, and Prinsloo delivered a breathtaking trio, Crida demonstrating technical mastery and surprising dynamics, despite the somewhat fluid intonation of the instrument. 1. Hearing and seeing such a small group playing such a great work, really brought the excitement back, because every musician has an important part to play. The role of conductor was unclear, instead the group performed with the mental synergy and eye contact that occurs in smaller ensembles, where performers do not follow, they move together, looking alive and alert. 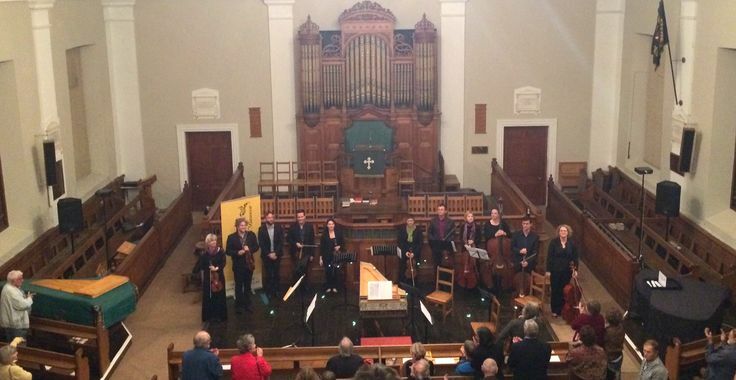 I enjoyed the soft breathy sound of the wooden flute, (Bridget Rennie-Salonen) and the exciting interpretation of the harpsichord part (Erik Dippennaar), with his eye-widening accelerandos of the composer’s miraculously unfolding melodic convolutions. 2. The trio of Rennie-Salonen, Dippennaar, and Crida, was a beautiful balance of the soft, rich, woody, sensual textures of the flute and violin, and the sensible, structural, meticulous harpsichord. 3. Again I was reminded of how well these performers work together, synchronously moving from triplets to crochets with immaculate unity. 1. After another impeccable entry from the whole group, I realised what an amazing sense of timing they have. The group occasionally pauses after a phrase, and re-enters as one instrument – they just feel it. Playing one part each, means that everyone has a chance to shine, which could explain their level of engagement with each other and with the sound they are producing. 2. We were treated to another fleeting harpsichord solo. One of the hottest debates in the interpretation of classical music is how to perform Bach. It happened so long ago, and the only references we have are written. (Like dancing about architecture.) And yet there may be a far more simple way to understand Baroque music, using the one thing that has not changed: our human emotions. Dippennaar seems to have a feel of how the phrasing makes emotional sense, so that the composer’s flow of progressions is easy to understand, as if he is providing a simple explanation for something that is indeed very complicated. 3. The final movement had us romping along in a dizzy waltz. CTB portrays Bach as a young vibrant genius, with dramatic dynamics and exciting tempo. The dialogue between parts was like watching acrobats catching each other. More than one mischievous smile tells me that they clearly love what they are doing, and their sense of fun is contagious. I can thoroughly recommend the experience of attending their next concert. This entry was posted in Classical Music Review, Concert Review and tagged Andy Wilding, Bach, Brandenburg Concerto, Camerata Tinta Barocca. Bookmark the permalink.